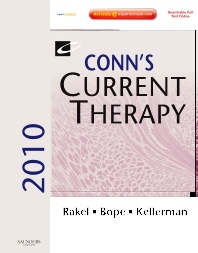 Conn’s Current Therapy 2010 provides concise and easy-to-use guidance on the latest advances in therapeutics for common complaints and diagnoses. Edward T. Bope, MD; Robert E. Rakel, MD; and Rick D. Kellerman offer their expertise and the knowledge of hundreds of skilled international leaders on the full range of evidence-based management options. Tap into recent developments and thorough updates on myelodysplastic syndromes, psychocutaneous medicine, recently-approved and soon-to-be-approved drugs, and much more to stay on top of current treatment practices. With the full text online at expertconsult.com, you’ll have the information you need right at your fingertips for easy access! Provides access to the full contents of the text online at expertconsult.com. Discusses recent developments and thorough updates on myelodysplastic syndromes, psychocutaneous medicine, recently-approved and soon-to-be-approved drugs, and much so you can stay on top of current treatment practices. Contains important diagnostic criteria in each chapter because correct diagnoses lead to the delivery of effective treatment. Features acknowledged expert contributors for each chapter so you know that you are getting the best and most practical and accurate advice. Presents management methods used by international experts to provide you with best practices from around the world. Covers most common major presenting symptoms in a section on symptomatic care to assure that your patients can get the best possible treatment while tests are being performed. Incorporates the latest information on recently-approved and soon-to-be-approved drugs so you are aware of all treatment options. Includes the ICD-9 list of common diseases and codes on end papers to enable you and your staff to accurately code for reimbursement.